Happy with the clams. An incredibly stable platform for cooking and dinning aboard. If you like to rock while you wine and dine, just time it with the incoming tide. The white sand beach is just over the dunes for wading, swimming and walks with my love. Success is a trip and sea trial of about 50 miles with one key element -zero- This is not the usual $112.50 dollars in fuel for a forty foot yacht (at about .5 mpg at $4.50/gal) but zero dollars in solar electric power. You truly buy the fuel when you buy the boat. The fuel is part of the boat. Even newer batteries and photovoltaic modules will have much greater power, efficiency and lifetimes compared to those of this prototype. I am merely working with currently available store bought power items. I am invested in advanced power systems, some of which are tested on the MOG, Algemac II, pictured here. In my youth, boat travel was with fossil fuels. This seemed as normal as driving the family 1956 Ford Club Sedan to the Esso station for gasoline at 20 cents per gallon. The MOG's fuel supply/gas station is in the sky. I have always detested vehicle mileage claims (especially boats) they are seriously compromised by the nettlesome fact, the pilot must drive out of their way to get fuel (often under the guise of a rest or dinning stop and then back track to the line of direction. Get real, the money/fuel you spend getting off the track and getting back on track IS part of your fuel economy (it is called wasted time & distance) and literally kills ‘stated fuel mileage’. Boat travel requires three basics, fuel, water, and food. If you have ‘time’ for a solar yacht….. fuel is not an issue. You are only constrained by food (if you have a water purifier/maker). I am not dating myself as much as I am dating many of those reading this blog. Make the mind shift…… You as well as I and the wife, are now confronted by a totally solar electric yacht. A boat that is over 39 feet long and has complete accommodations for two people in a home environment. This is not a scaled up kayak, narrow catamaran or day-boat where one hunches over to contort into a V-berth, soaks the toilet paper during a shower, pulls food out of a styrofoam cooler and rumples their clothing into cubby holes. It is a purpose built yacht powered by solar electricity. It was not built to break distance or speed records for its class. It is a nice looking home on the water (and land) that will set its own marks in new territories about which some could only dream. oil, fuel filters and hefty fines if just a quart of fuel/oil spills overboard. I also look forward to the day that the 60 hp gasoline auxiliary engine gets put out to pasture but more on that, later in the evolution. Now for the trip and sea trial. Firstly, forget that it was a sea trial. Everything worked well enough that I actually forgot that I was out to test the system. The wife (Hillary) was happy and as at home as I. Soon, former thoughts of glitches faded into the oohs and aahhs that only silence and clean exhaust can produce while sliding through a seaport such as Wilmington, NC. As many pictures as possible are framed by some part of the MOG. I want you to know that the Algemac II is real, functions as a boat and serves as a yacht. 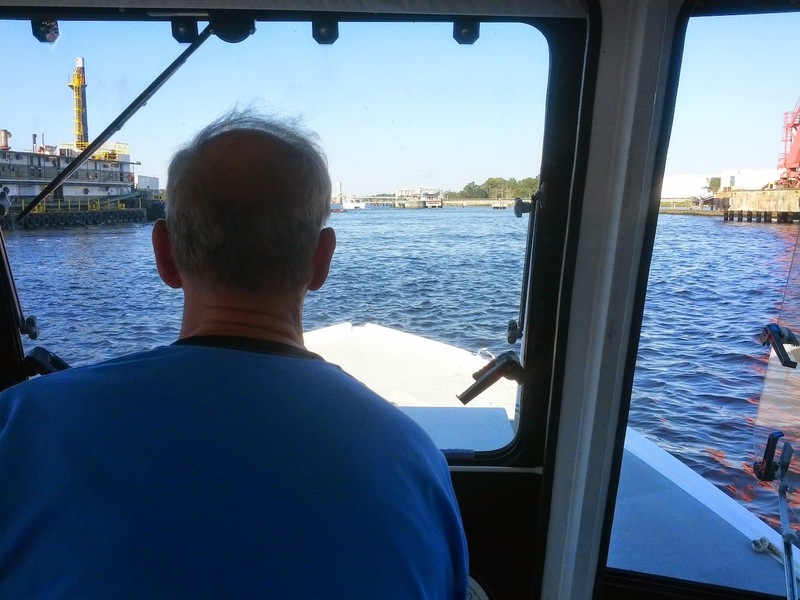 We departed the dock at Cape Fear Marina (Bennett Brothers Yachts) just after 10:20 AM. 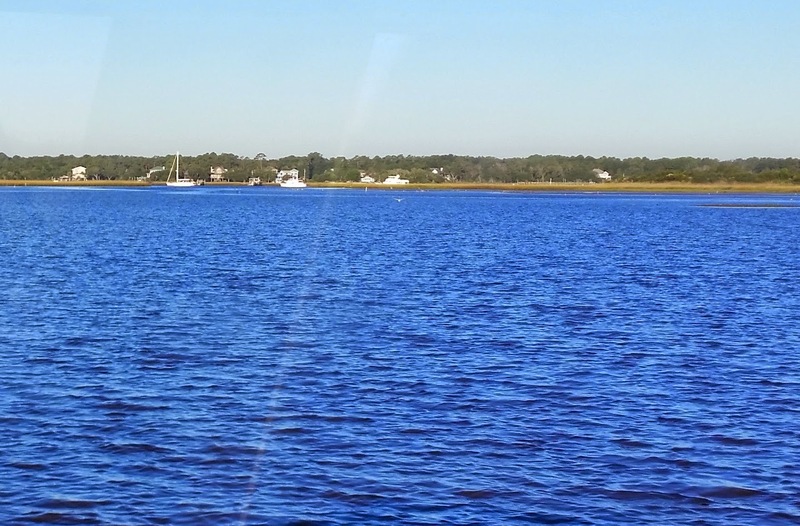 Weather was a balmy 70’s and a bit of 12 mph wind on the nose as we sailed south on the Cape Fear river. About half the length covered on the river was with the tide, yielding speeds of 7 to 8 mph ‘speed over ground’. Keep your head on a swivel. Although the speeds are slow, everything is sliding and passing in multiple directions all around. Not a Sunday drive here in a busy port. The port seemed quiet until we turned the bend ahead. From the time we left the dock until 11:57, the 60 hp gasoline outboard had been dragging in the water at idle, never used, and in neutral in case of an emergency. The 24 volt battery system was maintaining a constant 25.3 volts, amazing. Once clear of the dredging unit and the port docks, the engine was shut down and elevated above the water. Even when the auxiliary engine was in the water, our solar craft was generating more power than used. Obviously there was an improvement in speed and handling when the gas engine was lifted from the water. Around the bend we saw the port was busy with two tugs passing southward to pick up an additional freighter. This Algemac II performed admirably with less than 2/3 throttle. More power was coming into the batteries than going out to the electric motors. Once the river broadened out, the tide effect ceased southerly and reinstated itself counter to our intended direction. 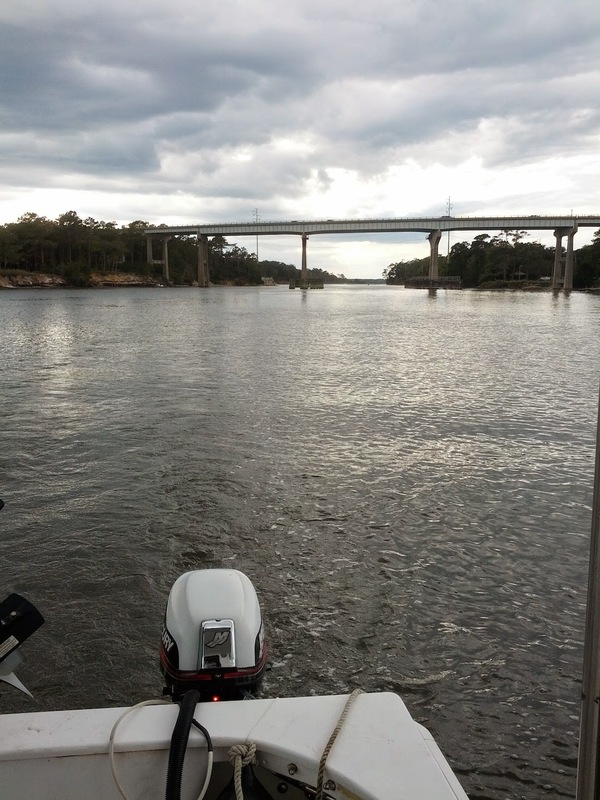 Although our speed was cut down to near 4 mph by the oncoming tide, the handling remained clean and the sun kept the battery power-out equal to the power-in. I will take being a little slower in exchange for free fuel on any sunny balmy day. In the video you can see the tide is coming toward the boat (there is a V shape opening up aft of the can buoy). The boat maintained a forward speed of about four miles per hour. Not exceptional until one counts the momentum as a Sun contribution. 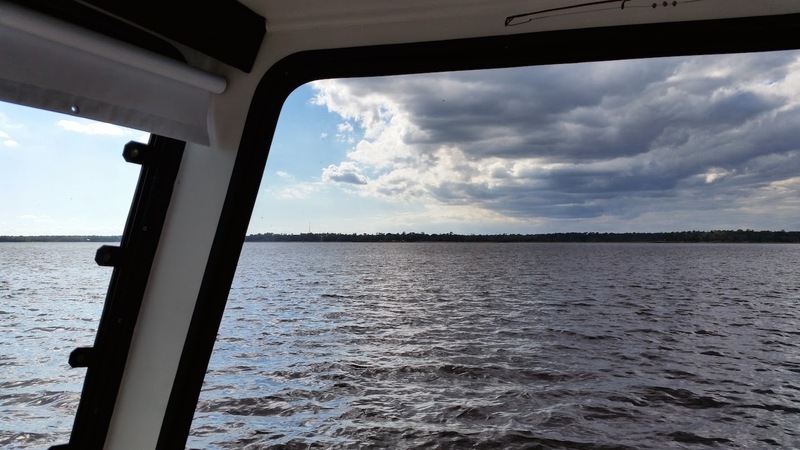 Literally, the clouds rolled in while the boat pushed ahead against wind and tide at around 12:32 on 10-16-2014, Cape Fear River. We were soon covered by the clouds. To add to the test of the boats solar generation, thick clouds rolled in, overtaking us as we kept headed for Snow’s Cut near the Carolina Beach inlet. The cloud cover began to effect the voyage’s battery bank on which we were running (there are two banks). The voltage dipped to 24.7 at 12:32 and never dropped below 24 volts all the rest of the way to the bridge at the end of Snow’s Cut at 15:53. The second point to be made is that all 15 miles was accomplished on just one of two battery banks. That means one completely full bank was available if needed. Prior to entering the Cut we picked up the tide flow again, resulting in zipping along at a good clip of about 6 - 7 mph and through the bridge as shown in the video. There were a lot of boaters waving hello and thumbs up as we passed big yachts and people fishing from smaller aluminum boats. Moving right along at 15:23 through the Snows Cut bridge about 6-7 mph with the tide and on Saturday’s return, 3 mph against the full flow. Note the cloud cover is completely over head. Through Snows Cut bridge on solar electric power only. This time with the tide… the next day was the opposite direction at full tide against our bow, slow but steady. This trawler was heading for the ‘cut’ at the end of the day with a train of pelicans feasting on cast offs. Soon after, we took the boat into a shallow sound behind the narrow beach at the ocean. At 16:15 the Algemac II turned into a shallow (36 inch) back bay from which the high tide had been almost half way removed. The idea here being to never go into the shallows on a high tide. The next tide might not be so high as the one upon which you entered…. you could get stuck for a day or months. After about 15 minutes we had reached the back side of the strip of dunes that separated this lovely estuary from the roaring ocean, just 275 feet over the white sandy dunes. From the deck and especially the top of the boat the ocean’s blue waters churned onto the beach, our new living room view. At high tide the ocean was viewable from inside the boat, just over the dunes. We could stay here as long as the food lasts, what a beauty. The next day. Hillary standing in amazement at the sight of her new beach house. Yes you really can have it all and no real estate taxes. We also got along just fine with the neighbors. 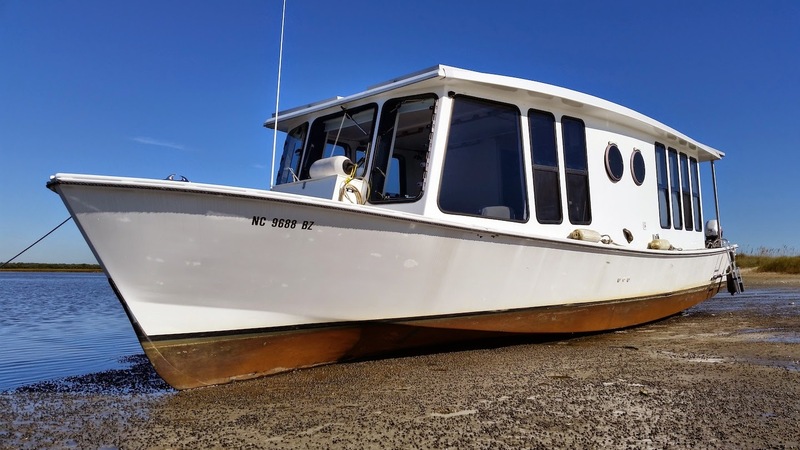 After the hook was set in the receding 30 inch water, a second small anchor was thrown out to assure that the fickle wind that may arise at night will not drive either end of the boat onto the beach. 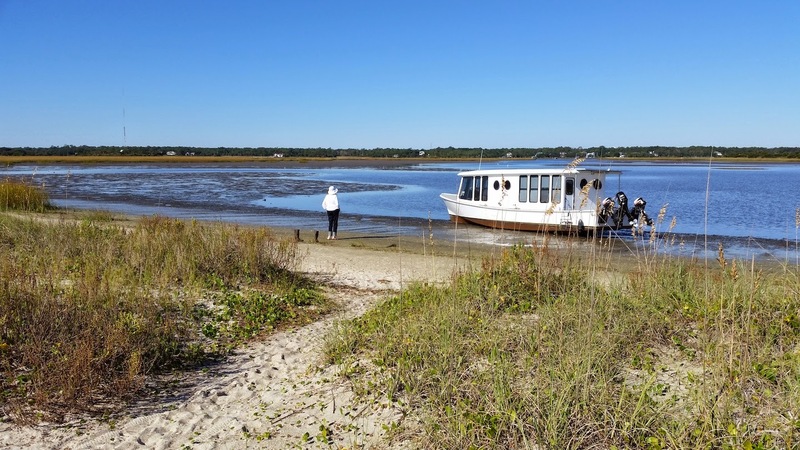 The last thing we want is to have any part of the boat’s water line above the high tide line on the beach, leaving the boat stranded. That would be bad news. In fact the wind did come up that night and pulled the smaller stern anchor enough to raise an eyebrow in the next mornings first dawn view. All was fine, as the position was well below the high tide line. That morning we heard that Gonzalo, the Bermuda hurricane, had started to alter the idyllic weather we had expected and gusts to possibly 30 mph might come our way. Having left the city of Wilmington, NC on Thursday, all day Friday was spent relaxing on the sound, collecting sea shells, walking and wading into the Atlantic Ocean. Hillary and I discussed the idea of paring the trip down by one day and leaving for the return to Wilmington’s down town on Saturday. This meant leaving in the late afternoon. This would also pit the solar electric yacht and its two ten horsepower electric motors directly against the full outflow tide, funneled at our bow by the restrictive placement of the bridge at Snows Cut. Even for power boats of much more horsepower it is of some concern. We would be making the move at the end of the day, the sun would be setting, glaring directly into our eyes with small and large boats dodging about. A new anchor haven would need to be made in declining light and secure enough to fend wind and wave from the close commercial sea lane channel. A bit of a reach. Far from our 30 inch depth, three sizable yachts ply the deep and marked channel from which they cannot stray. Only kayaks, paddle boards, small boats with outboards tilted up, get here. We left our shore side villa beach property Friday at 14:48. 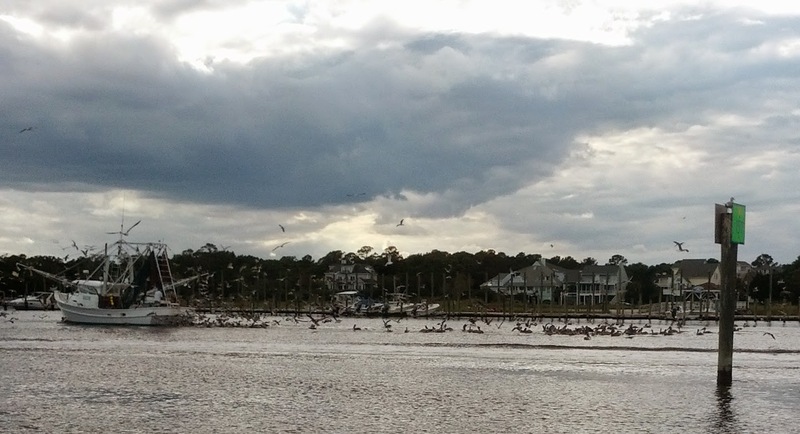 A temporary anchorage was made about a quarter mile away next to the ICW to assure there was no delay from winds suddenly changing direction, thus blowing the water out from under us. A plan was made as to the 6 mile attack to reach an island on the commercial channel just the other side of Snows Cut. We waited a bit for the weather forecast, then pulled anchor again at 16:45, headed for the cut. For about one mile the cruise was nice but began to get slowed to the expected 3 mph imposed by the tide. We could go faster but no need to waste the energy in the full battery banks. If taken at the correctly planned pace we should arrive at our destination with power to spare and some bright dusk to find our anchorage for the night. Guess what? That is exactly what happened with wind against us, tide against us and almost no sunlight to recharge the batteries. We went into a cove at a spoil island near green marker 7 to eat, view and bed down for the evening. Here’s to sun in your eyes. The camera adjusted its iris to the glare but our human eyes were not as fortunate. The anchor was placed with plenty of scope to view the setting sun during our wine and dine. Our draft is 18 inches. The water depth here varied from 20 inches to over 40 inches. Dark fell and the sky became our private planetarium. At 08:30 the next morning’s weather radio alerted us to the fact that the hurricane off Bermuda could cause some unwelcome local weather patterns. 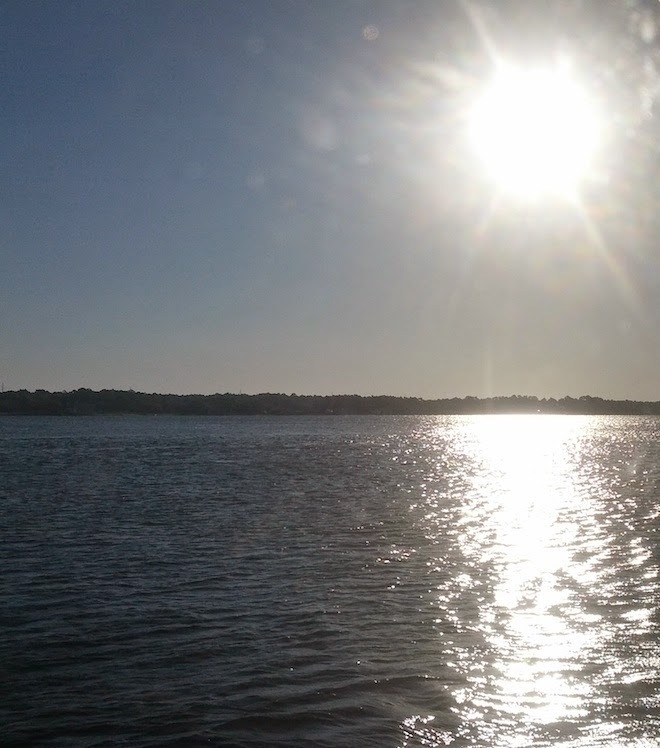 We would leave our corner of this lovely spoil island and head for down town Wilmington as the sun replenished our batteries from the passage through the cut last evening. This Saturday’s weather though was just superb, sunny, wind on our tail and some tide to boot. I could not ask for more. We ate breakfast, relaxed listening to the FM radio, had coffee from the microwave as we got things into order for the last leg of the trip. The time approached to haul the anchor and get moving North. At 13:07 the anchor came up and we were off to Wilmington. At 13:37 to our amazement, while in mid channel, a clunk was heard, stopping the starboard electric motor briefly. We saw no damage, checked the systems out and headed on our merry way. The boat will be hauled out in the next few weeks for winter work to be done, keeping the clunk in mind for a look-see when on the hard. 13:50, the tide flowing north on our side of a marked island channel, combines with the ship’s channel on the other side of the island. At this point our forward progress is opposed by the eddys of large churning areas of water. This persists for a while, then continues as a very light tide northward through the port. With the port in full view, there seem to be some boats waiting for something. Drawing ever closer, the apparent blockage is caused by the dredging machine happily gorging away at the face of the port’s docks. While the dredge is working this close to the dock face, no traffic may pass through. With barely enough side clearance, an 18 foot outboard boat with a family on board, catches the ire of the deck hands on the dredge. Saying it was a close call would be an understatement. Dredging Fear as the iron monster heads back our way. Now fully open, a 40 foot tour boat makes its escape ahead of us as we enter the ominous “zone”. A bit melodramatic but it is unnerving. We turned our boat to circle the area several times to await the more officially accepted opening of the dredge. Allowing the faster boats to go first (a most prudent move), we followed them through the opening after waiting for the downstream boats to exit their flotilla. 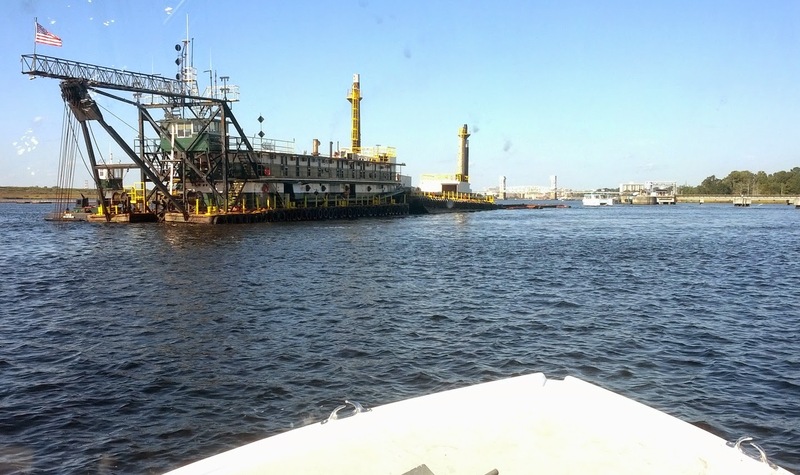 This time the dredge workers seemed a bit more cordial, even though they had to work on this sunny Saturday. My pass, before the dredge swings back to close the narrow passage. Not shown here are the other boats trying to make it through before the dredge swings closed. Is my hair standing on end? The concentration of prop wash and the narrowing of the river current made a very sloppy pass through the area. We were not the only boat passing through the dredge's gate. 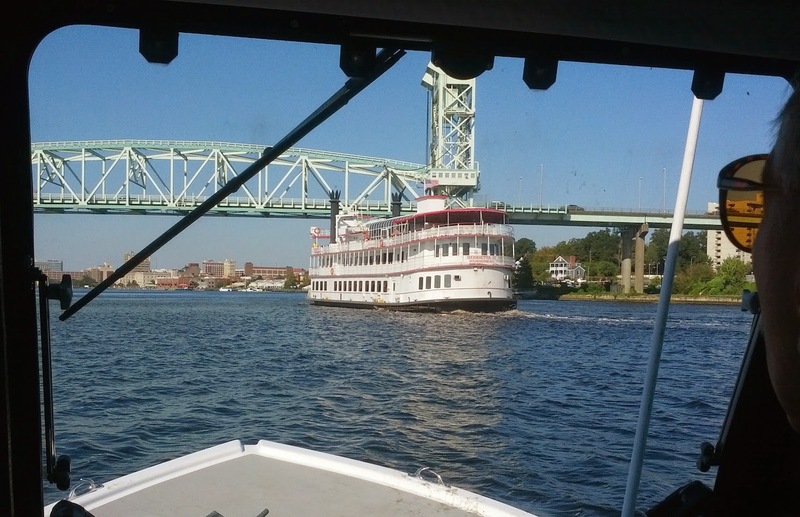 The Wilmington bridge and skyline welcome us home as the Henrietta III passes on our starboard side. Farther up the Cape Fear river and directly across the river from Wilmington’s Market Street water front, was the annual October (beer) Fest. Seems all were having a great time. 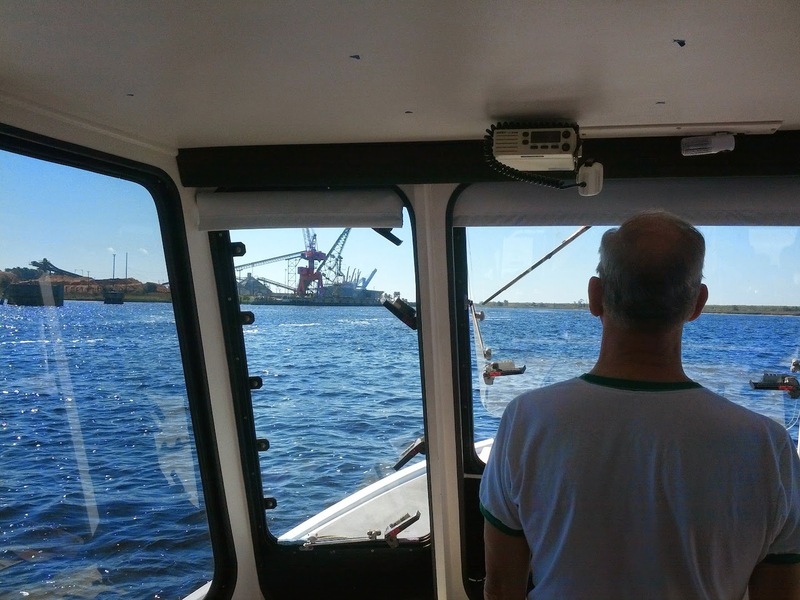 The trip drew to a close as we cleared the Isabelle Holmes bridge with a south westerly wind and southerly flow of tide at our Cape Fear Marina dock and berth. The boat was paused about 200 feet off the docks so that I could lay in wait on the wind and tide interaction, a good practice no matter what size or power the boat has. Watching the wind’s action on flags and the tide’s action around the docks, I can adjust my entry options into the fairway leading to the 6 slips in the intended section. A plan of entry is kept in mind with actions mentally noted for contingence and conditions not clearly anticipated. 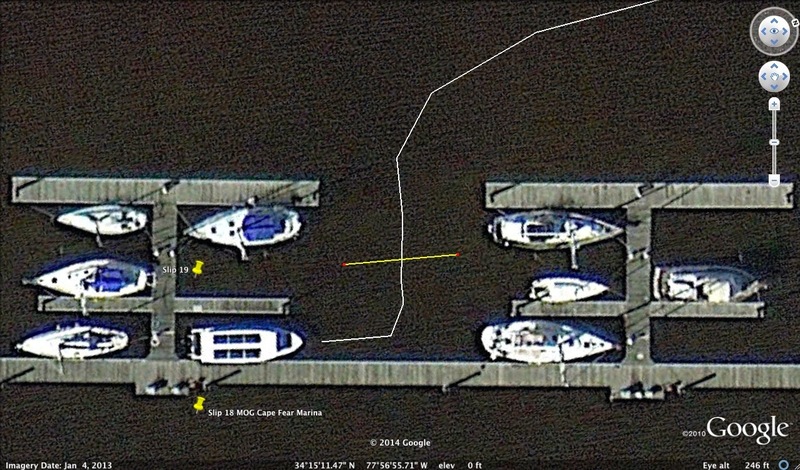 This older Google Earth photo shows the MOG pointed out of her slip. She is now nose in, after this trip. I usually enter the fairway parallel to the docks providing excellent fore to aft corrections while allowing (in the usual case) the wind to gently blow her into alignment with the slip. Her bow was pointed south and the wind was blowing out of the south west. This seems to work well in this situation where the tide flow can have strong effect on a boat crossing the tide’s north or south direction. The response of the electric motors is very rapid because there is no time lag involved, as for a regular fossil engine transmission, to switch gear direction. Once I was in alignment with the slip, a little nudge forward on the remote control joysticks, eased her into the slip and to a full stop. The remote control is carried by me anywhere on the boat so that I can see the exact clearance, depth or nearness of any potential threat. Usually I steer while sitting on the foredeck but I have brought her in or out of a slip from the stern.